April 8-14 is international Anti-Harassment Week. This week activists will continue to build on the momentum of the #MeToo movement and rally against the issue of street harassment and elevate prevention strategies stop it. Held during Sexual Assault Awareness Month (SAAM), Anti-Street Harassment week illustrates the need to stop the factors that allow gender-based violence and sexual violence to persist. According to a recent study by Stop Street Harassment The Facts Behind the #MeToo Movement: A National Study on Sexual Harassment and Assault verbal sexual harassment is the most common form of harassment. Street harassment happens multiple times for most people according to Unsafe and Harassed in Public Spaces: A National Report on Street Harassment. 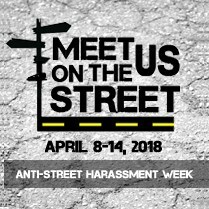 Verbal sexual harassment can happen anywhere and this week we are focused on the street, one of the most public spaces people encounter every day. This week let’s raise awareness about the issues and prevalence of street harassment and elevate the need to change and reclaim our public spaces. There is a need to change our streets, to prevent street harassment, and to end gender-based violence. What will you be doing for Anti-Street Harassment Week? International Anti-Street Harassment Week is organized by Stop Street Harassment visit their website for more information and ways to get involved.